After much deliberation and waiting for a bribe, we have decided on the winner of the March Caption Contest. With so many excellent entries it was a tough decision. Welcome to Slap the Penguin, a collection of the finest comedy minds sharing their wit and wisdom to the world. We offer satirical news, social commentary with just a sprinkling of slapstick. If you like what we do, tell your friends, if you don't like what we do then tell your friends anyway, they probably have a better sense of humor than you do. We have subscribed to many social media outlets including facebook, twitter, pinterest and google+. You can follow one or all of our shallow networking efforts so that you will never miss a slap, and we can increase our numbers. Thanks from Ian, Brad, Tina, and Alexa. Dear Tina - How do you pronounce .GIF? 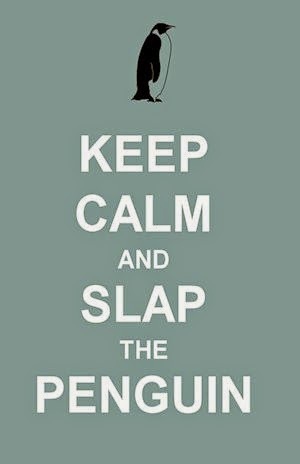 Slap the Penguin is a satirical news blog and as such is intended to be funny. Since the definition of comedy is broad and humor is subjective, we cannot be held responsible for posts which the reader deems to be unfunny. If you wish to complain about the standards of humor please send an email to garbagecan@slapthepenguin.com and your complaint will be dealt with accordingly. Many of the posts on these pages are fictional and many of the facts are made up. The facts may have originally been based in truth, but at some point they have been manipulated to make the post funnier or more believable. As a satire/parody/spoof/news blog, we invoke the right to use images according to fair use laws, both as a news reporting service and as a source of satirical comedy. If you are (or represent) the copyright owner of any images used on this site, we urge you to contact us in order to come to an arrangement regarding use of the imagery. We would be delighted to credit the copyright owner and link to the source of the image or the owner's website. Additionally, no penguins were harmed in the making of this blog. By reading this blog, you agree to conform to the term and conditions laid out below. We wrote this and it's ours. Do not steal. We are willing to share so contact us for details. We use adserving devices on our pages, each of which have their own cookie policies. We invite you to familiarize yourself with their own T&C and procedures for opting out. Slap the Penguin writers are entitled to half of your worldly possessions and that we can access these possessions at any time with 7 days notice. We can also liquidate said assets and keep the profits for our own personal use. If you do not accept this condition you must leave the page within 30 seconds. © 2010-2019 Slap The Penguin. All Rights Reserved. Powered by Blogger.